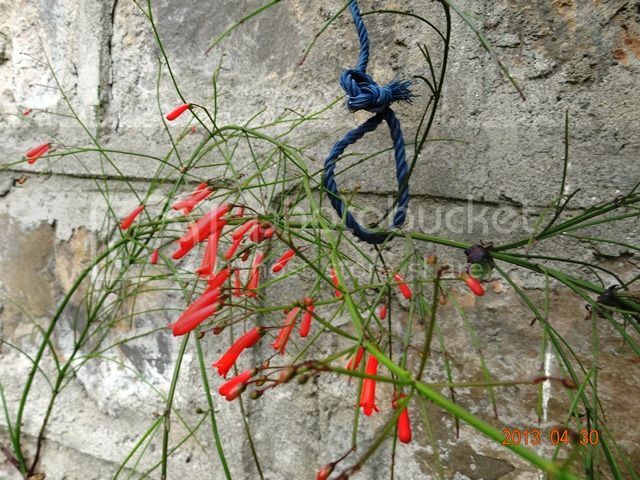 The full bush has sufficient foliage; here it is only a twig growing in the stone wall, without any soil for roots. I had removed the bush from the ground just below this remnant, which somehow got stuck in the stone( see left bottom corner of the picture) & has survived for over a year & flowered.It may be getting nourishment from the air. munir wrote: The full bush has sufficient foliage; here it is only a twig growing in the stone wall, without any soil for roots. I had removed the bush from the ground just below this remnant, which somehow got stuck in the stone( see left bottom corner of the picture) & has survived for over a year & flowered.It may be getting nourishment from the air. Do others have explanations as to how Munir sahab's Russelia is growing on a stone wall? Ficus is another interesting plant which grows on stones- one can see Ficus (peepal trees) growing on the walls of old apartment buildings of Karachi (unfortunately, drawing water from the leaking sewage lines). Farooq you are right, it can't survive on 'nothing' . Certainly there must be some minimal growing environment that keeps it going. What I meant was that it is not a proper full size plant & is there on its own with practically no care.I seem to have over-emphasised this aspect earlier.